I sculpt the hull of the vessel in clay, then make a mold with plaster gauze, which I cover with the handmade paper, made from abaca pulp, I paint the hull with layers of acrylic washes, sanding between each layer, I find interesting driftwood and seed pods on the shores of Lake Ontario incorporating them onto the vessel, paper raffia is woven onto the wood on the hull. 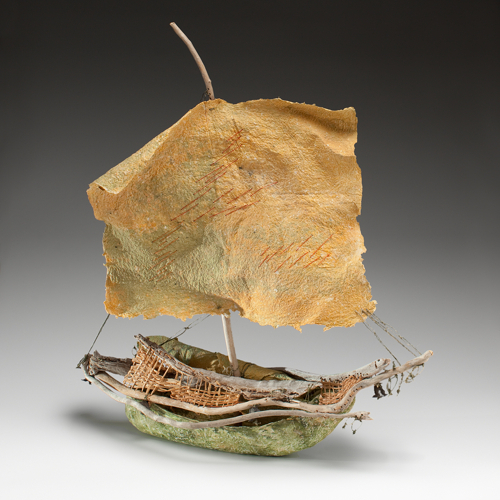 The sail is made from abaca pulp, dyed with pigments. I use my needle and threads to “paint” slashes across the sail. 34 inches long x 28 inches high x 11 inches deep.